Samsung announced a wide range of new products just last week. 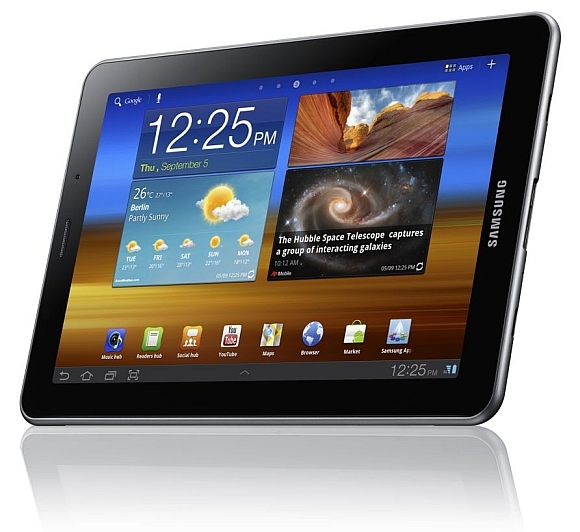 The Galaxy Tab 7.7 is a brand new tablet which joins a number of other high-end products competing against Apple, that include 4G smartphones like the Samsung Exhibit. The successor to the original Galaxy Tab, the device was slated to be shown during this year’s IFA Trade Show, however Samsung was forced to remove the Galaxy Tab 7.7. This came following a court order courtesy of Apple, according to Florian Mueller from Foss Patents. Samsung’s 10.1 inch Galaxy Tab was originally banned in Germany, and now it appears Apple has obtained a new injunction against the recently announced Galaxy Tab 7.7. This sort of thing could continue for months to come until Apple and Samsung reach a decisive agreement.